SIGMA is organizing all its interchangeable lenses into three product lines; Contemporary, Art and Sports. Among the three, the Contemporary line is a high performance line which incorporates the very latest technology making it possible to accommodate both high optical performance and compactness for use in various photography situations. Sigma has solved the difficult problem of keeping the size and weight down without compromising optical performance and function with the latest technology. This lens covers frequently used wide-angle to tele-photo, as well as macro photography. SIGMA has always been producing a high performance standard zoom lens, dedicated for digital DSLR cameras, that covers up to 200mm by reflecting the latest technology. In 2005, SIGMA released 18-200mm F3.5-6.3 DC as a smallest and lightest all-rounder lens in class that covers from wide-angle to tele-photo range. SIGMA, in 2007, incorporated OS (Optical Stabilization) functionality, and in 2011, has successfully made the size of the lens even more compact. Now, this new lens has been redeveloped as the standard zoom lens from SIGMA’s new product line, which has higher performance, is even smaller and lighter-weight, and on top of that, includes “the macro feature”. As an entry level interchangeable lens, it is capable of many photographic scenes. We pursued the compactness as an ideal everyday lens. From an early stage of development, SIGMA was determined to make the lens size compact, for example, by incorporating double-sided aspherical lens elements and downsizing the motor. As a result, while the predecessor had a diameter of 75.3mm, this lens has reduced it to 70.7mm, which has the difference of 4.6mm. It also achieves -11% in volume ratio compared to its predecessor. It is one of the smallest in its class of lenses with more than a 7x zoom ratio, and is more comparable in size to a generic standard zoom lenses. With our Contemporary line, the lens is required to fulfill the maximum potential while achieving a compact and light-weight construction. This lens incorporates SLD (Special Low Dispersion) glass elements that have a high refractive index, and corrects chromatic aberration at the telephoto-end very well. Moreover, aspherical lens elements, including double-sided aspherical lenses, ensure a compact size and excellent correction of distortion. This also helps to produce superior rendering performance throughout the entire zoom range from wide-angle to tele-photo and macro photography. One of the biggest features of this lens is that it is possible to shoot subjects as close as Macro lenses. This lens features a minimum focusing distance of 39cm and a maximum magnification ratio of 1:3. It offers the versatility for shooting close-ups of fashion accessories, cuisine, flower arrangements and much more without changing the lens. Its working distance is 14.7cm, and it is suitable for shooing images with natural light as it keeps the shadows of camera and lens off of the image. On its lens barrel, it indicates the maximum shooting magnification at each focal length, and it is so convenient for a photographer that the size of the object in the image sensor becomes easily recognizable. Uncompromising in every aspect of lens design, Sigma has even chosen to engrave the product name on the front of the lens to prevent reflections of the letters during close-up photography. In product development of cameras and lenses, it is crucial to lay out main components, metal parts and polycarbonate, to optimize and ensure each feature. This lens has incorporated TSC (Thermally Stable Composite) that has the same level of thermal shrinkage as aluminum and little elasticity, especially in temperature changes. Since thermal shrinkage is low, it has a high affinity to metal parts that contributes to high precision in product manufacturing. It also results in slimmer mechanical parts, such as the zoom ring and scaling. Flare and ghosting were thoroughly measured and monitored from the lens development stage to establish an optical design which is resistant to strong incidental light such as backlight. The Super Multi-Layer Coating reduces flare and ghosting and provides sharp and high contrast images even in backlit conditions. Attaching the matched petal type hood, which is supplied, will provide extra protection from flare and ghosting. The 7 blade-rounded diaphragm creates an attractive blur to the out-of-focus areas of the image. Hyper Sonic Motor HSM (Hyper Sonic Motor) delivers high AF speed and extremely quiet performance. With the latest AF algorithm, smoother AF is achieved. We used to measure lens performance with MTF measuring system using conventional sensors. However, we’ve now developed our own proprietary MTF (modulation transfer function) measuring system (A1) using 46-megapixel Foveon direct image sensors. Even previously undetectable high-frequency details are now within the scope of our quality control inspections. 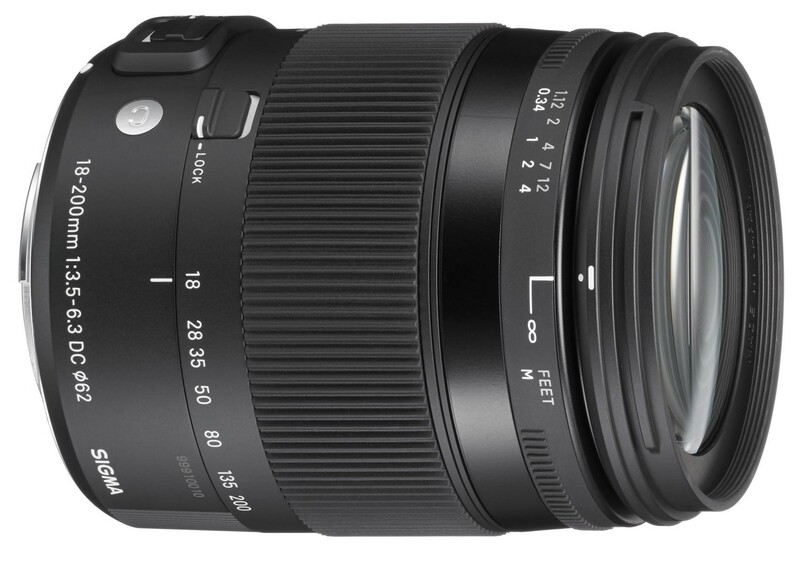 The SIGMA 18-200mm F3.5-6.3 DC Macro OS HSM will all be checked using this “A1” before they are shipped. The vast majority of Sigma’s manufacturing – right down to molds and parts – is carried out under an integrated production system, entirely in Japan. We are now one of the very few manufacturers whose products are solely “made in Japan”. We like to think our products are somehow imbued with the essence of our homeland, blessed as it is with clean air and water, and focused, hard-working people. We pride ourselves on the authentic quality of Sigma products, born of a marriage between highly attuned expertise and intelligent, advanced technology. Our sophisticated products have satisfied professionals and lovers of photography all over the world, because our manufacturing is based on genuine craftsmanship, underpinned by the passion and pride of our experts.